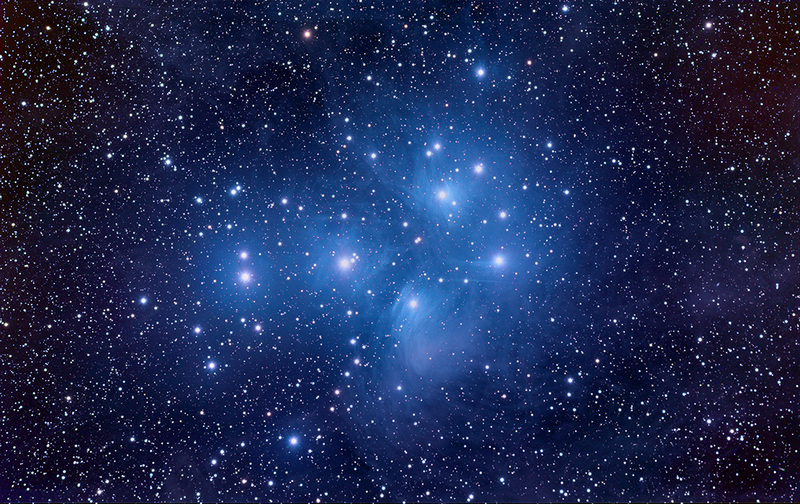 The Pleiades, commonly known as the "Seven Sisters," are 375 light-years distant and estimated to be 100 million years old. Visible in this image is the blue reflection nebula associated with the brighter members of the cluster. This nebulosity can be detected visually under good conditions. A common test of visual acuity and observing conditions is to identify the number of Pleiads visible to the naked eye. Most observers under reasonably good conditions can identify at least six, while some keen-eyed observers have claimed to have identified as many as 16. In the higher-resolution versions a tiny magnitude 17.9 edge-on spiral galaxy (UGC 2838) can be seen to the right of Electra, the bottom right star in the "bowl" of the "dipper" formed by the brightest stars of the Pleiades.